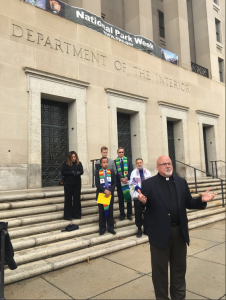 On Thursday, a group of Native American and faith leaders delivered a letter signed by more than 500 clergy and faith leaders from 40 states to Interior Secretary Ryan Zinke opposing weakening the Bureau of Land Management’s (BLM) Methane and Waste Prevention Rule. Today, April 23, is the deadline for public comment on the proposal. Methane that is leaked, vented, and flared on our shared public lands creates public health hazards, alters our climate, and wastes valuable natural gas. This letter was signed in response to the Trump administration’s recent suspension of the critical environmental safeguard. Methane is a greenhouse gas more potent than carbon dioxide; it traps up to 80 times more heat over a 20-year period than carbon dioxide. Venting, flaring and leaking methane from oil and gas operations is the second largest industrial contributor to climate change in the United States. 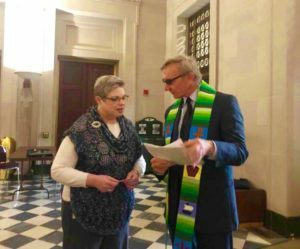 “As people of faith, we have a moral obligation to care for our land, water and air and to protect the health of our communities, and especially the children and future generations. This rule will keep an estimated 175,000 tons of methane emissions a year out of our air.